Venice Paparazzi rolled out the red carpet for Sea of Ink's fun filled night of live art, music, tattoo's, raffles and more! The artist of the night was Audrey McNamara, music by DJ Fluffy (a.k.a. Block) among others, bartending by the beautiful Becky and lighting by Ryan aka Tink!. View photos of Venice's newest tattoo and art gallery and the beautiful people that stopped by to support local art. ABOUT SEA OF INK: Sea of Ink is the latest cutting edge tattoo shop to hit venice, we bring a friendly atmosphere, beautiful work, and everything else anyone could expect at a custom shop as well as so much more, come check us out to make an appointment, see the art, or get a taste of the future of tattooing. THINKING ABOUT GETTING A TATTOO? Bring in a California I.D. 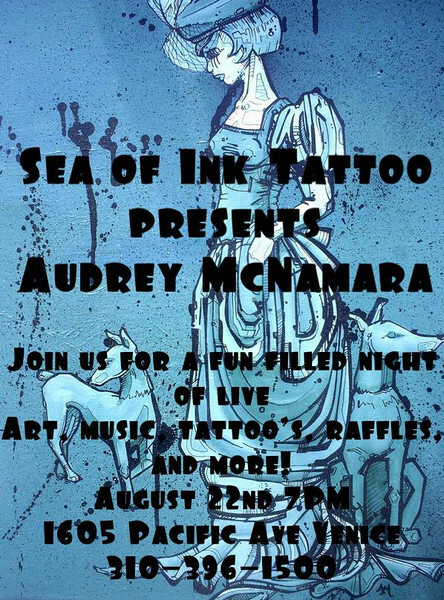 with a 90291 area code to Sea of Ink Tattoo Shop and receive 25% off your tattoo. Visit the shop, check out the custom art and talk to any of their artists at 1605 Pacific Ave. Venice, CA 90291 or call 310.396.1500. For artist profiles and other information visit their following websites. COMPLIMENTS OF SEA OF INK TATTOO AND VENICE PAPARAZZI, GET YOUR FREE PHOTOS FROM THIS GALLERY. IF YOU HAVE A P.C. "RIGHT CLICK AND SAVE" TO GET YOUR "FREE" PHOTOS! IF YOU HAVE A MAC... JUST DRAG PHOTO TO YOUR DESKTOP. ENJOY!